"There's safety in numbers, if you've heard of that. It just so happens I'm heading West myself, and unless you're dumber than I think, you'll throw in with us." Set during the latter years of the Civil War, Bad Company is the story of Drew (Barry Brown), a clean-cut Christian boy who leaves his family, on the run from the Union army and the fear of being drafted. He stops in a small town and ends up getting robbed by Jake (Jeff Bridges), the leader of a gang of scoundrels and ruffians trying to scare up enough cash to go west themselves. The two encounter each other again, and after a brawl in the kitchen of a kindly Christian woman, they end up running off together and sticking her with the damages, and Drew reluctantly joins Jake's little bunch of hooligans. The rest of the story is something of a comedy, as the entire group heads off together, encountering various criminals and robbers along the way. Their story unfolds episodically, with a few amusing bits including the group's squeamishness at cleaning the rabbit they've killed for dinner, their haggling with a man trying to prostitute his wife to them, and a dinner at gunpoint with a disgruntled farmer. The performances are decent but unmemorable across the board. Bridges plays a fairly charismatic lead, though Brown is rather dull in his role as narrator. The rest of the group members blend together, failing to distinguish themselves as characters, though some of the blame for that lies with the script, which does little to expand any of the peripheral characters. Robert Bent's direction is workmanlike, and the slow pacing robs many of the scenes of what little comedy value they have. Jokes that could be funny tend to take way to long to set up, making the meager payoffs less than worth the wait. The film is still generally entertaining, though, if only for the relationship between Jake and Drew—their two personalities are so different, and their conflicts and eventual friendship produce most of the genuine humor. Jake and Drew, they're good company. Image Transfer Review: This is an OK transfer for a catalogue title of this age, but it doesn't quite equal Paramount's usual stellar work. Perhaps the biggest problem is the print used for the transfer, as it shows more than a few lines and scratches and quite a lot of grain (mind you, some grain will always appear with older films, but the amount here threatens to cause compression artifacts). Colors look a bit dull, though stable, and black level and shadow detail could be better, as dark scenes look a bit muddy. Still, entirely watchable all the same. Audio Transfer Review: Grading based on the original elements, I have to say that the included mono track sounds pretty good. Dialogue is clear and understandable, with good fidelity, and music and sound effects sound generally clean, if a bit unsupported. Granted, this mix won't light up your receiver, but it presents the film as intended and originally screened. Extras Review: Extras are limited to English subtitles and a respectable 14 chapter stops. 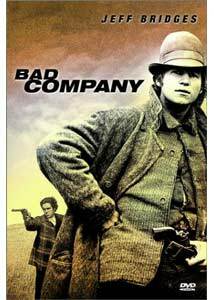 Bad Company is a fairly entertaining comedy-western, if one that seems a bit slow-paced and uninspired nowadays. Paramount has done a decent job with the video and audio transfers, but the high price and lack of supplements mean this one is recommended for true fans only.